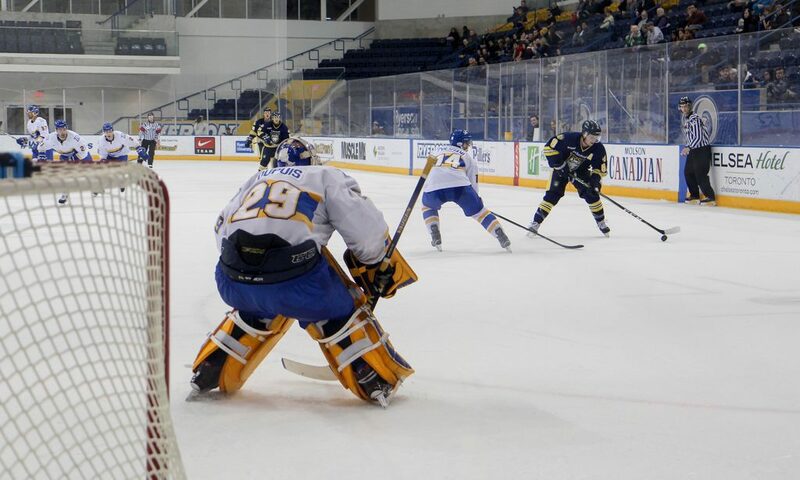 There was a lot of back and forth in Thursday night’s hockey game as the Ryerson Rams took on the Lakehead Thunderwolves at the Mattamy Athletic Centre (MAC), but it was the Rams who emerged victorious when the buzzer went off at the end of the third. Ryerson beat the Thunderwolves 5-4. The Rams struggled both offensively and defensively in the first period, allowing 18 shots on net for the Thunderwolves and only producing three. It was only a matter of time before one slid past Ryerson goalie Tyler Dupuis, as he was bombarded at the net by a crowd of dark blue and yellow jerseys. With seven minutes left to go in the first period, the Thunderwolves scored. It was defenceman Tyler Anton with the goal. The Rams came out flying in the second period after captain Alex Basso opened the scoring in just under nine minutes. Despite being outshot 20 to 7 by the Thunderwolves, the Rams tied it up 1-1. They struck again a few minutes later; this time it was forward Devon Paliani who flipped the puck past Thunderwolves goaltender Nic Renyard for his second goal of the season to make the score 3-1. Alex Basso shone for the second time when he scored a short-handed goal with less than two minutes remaining in the period. It was his second goal of the night after being miscredited with scoring another goal earlier in the game. It was a strong second period for the Rams. Despite trailing in shots on net 12-26, they were in the clear leading 3-1. That momentum carried over into the third period for the Rams as forward Tre Folks slid in his first goal of the season at 17:23. The Thunderwolves’ forward Brennen Dubchack responded almost immediately with a goal of their own to make it 4-2, but that was quickly followed by another goal by forward Sam Schutt. After maintaining a breakneck pace for much of the second and third periods, the Rams were clinging to a 4-3 lead with 13 minutes left in the game. Their slim lead didn’t last long. Thunderwolves forward Daniel Del Paggio scored to level the score at four each, with three minutes left in the game. Lakehead cheers rang around the ice, and Rams heads dropped. They let a two-goal lead slip in the third. How quickly the tables turned yet again when, with just seconds to go in the third period, the Rams secured the win. Forward Steve Harland scored the game-winning goal to make the score 5-4 with 20 seconds left in the game. With their thrilling, last-minute victory, the Rams’ record improves to 15 wins and 10 losses. The Rams and York University Lions both sit on 31 points with 25 games played in the Western Conference, with just three games remaining in the regular season. The Rams play the Guelph Gryphons on Saturday, Feb. 3 at 7 p.m., away from home at the Gryphon Centre Arena. I really like airports. If I could afford it I would fly on a daily basis. I've been to every province but British Columbia. I think baseball is the best sport, and chocolate should be its own food group.